Seasoned hackette Bev Creagh and flamboyant newshound Stewart Carr give their always opinionated and sometimes opposing views in The Creagh/Carr Review. Here, they reveal their very different thoughts on Northern Ballet’s Swan Lake at Milton Keynes Theatre. CREAGH SAYS... This is Swan Lake as you’ve never seen it before . . . boys on bicycles, a haunting gay romance and not a tutu in sight. I loved every magical moment, the choreography melding with Tchaikovsky’s exquisite music, the dancing fluid, expressive and wordlessly eloquent. Javier Torres is a brilliant, brooding Anthony, far chunkier than your usual principal male ballet dancer. He’s tormented by the death of his brother, withdrawing from his friends to seek solace in his memories. As he grows to manhood, he seems equally tortured by his own sexuality in lingeringly sensual moments with his friend Simon (Giuliano Contadini). And although the story is set in 1912, it has a modern pace. The birthday party scene with Odilia (Martha Leebolt) is an exuberant tour de force, as much for the acrobatics of dancers in dinner suits somersaulting over chaises longues as for the various groups flirting and drinking - more Matthew Bourne than traditional ballet. Odette (Ayami Miyata) moves so elegantly her dainty feet barely touch the ground as she emerges from the lake in a soft feather-and-down skirt that perfectly captures her mystical swan-like qualities. Odilia’s grief when she realises Anthony doesn’t love her is agonisingly raw and realistic. No wonder there were so many ‘bravos’ from the first night audience. And having a real live orchestra - the Northern Ballet Sinfonia - was the icing on the cake. CARR SAYS... This radical re-staging of Swan Lake might excite ballet fans keen for a fresh take, but it’s not a one to win over newcomers. In fact, it’s a Swan Lake so unlike any other I barely recognised it. Floaty and informal, it has a pale Edwardian style with boys in breaches lounging in the sun and young ladies with parasols and flowing gowns. Playful and laced with comedy, it experiments with a gay twist between two of the male dancers. All very quaint, but perhaps too much so – for what should be one of the most dramatic and unearthly dance numbers you might ever see. I wanted more action at the start, and it took maybe the second act before I really started to feel engaged. I’ll be honest, I’m a traditionalist when it comes to ballet. For those of us who don’t have an encyclopedic knowledge of it, something about the harsh technique and overwhelming melodrama just wins you over. I even like the stiff tutus and garish tights. And call me Scrooge, but this new production was too gentle for the angry classic that I’m (a bit) familiar with. But on a positive note, Javier Torres gave us a strong, masculine presence as Anthony, and Ayami Miyata was the most perfectly doll-like Odette, spinning across the stage. Hats off to Northern Ballet for taking a chance and reimagining a classic for modern audiences. I just hope others get it better than I do. 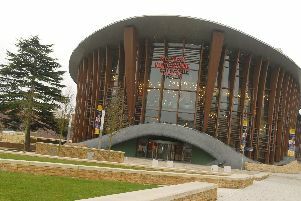 Swan Lake plays at Milton Keynes Theatre until April 30. See here for tickets.